Published in 2006 by Bloomsbury. Challenges - RIP, Reliquiae and 100 books. It is night on the Marram Marshes; a full moon shines down on the black waters and illuminates the night-time Things who are going about their business. Silence hangs in the air, broken occasionally by the glugs and gurgles of the Quake Ooze as the creatures tha tlive beneath it make their way to a feast. A huge ship with a full complement of sailors has sunk into the Ooze and Things are hungry- but they will have to fight the Quake Ooze Brownies for the leftovers. 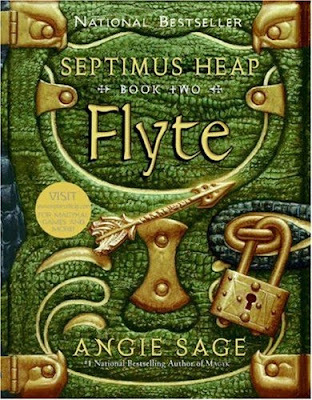 This is the second book in the Septimus Heap series. I reviewed the first one, Magyk , here. This is not going to be a long post, as it would be pointless for you to read if you have not read the first book in the series. All I will tell you about the story line is that Septimus has now become the ExtraOrdinary Wizard's Apprentice and is quickly becoming a very capable magician. During this book, his sister, the Princess has been kidnapped by someone meddling in the Darke side. Septimus is shocked by the identity of the kidnapper and with the help of his family sets out to rescue her and save the ExtraOrdinary Wizard at the same time. I am really enjoying this series of books. As a sequel, it did not disappoint, in fact I thought the storyline was actually an improvement on the first and seemed to have a better direction. Septimus has grown in character and strength and now has more belief in his potential as a Wizard. You cannot help but love the characters in the book. Within this book, the Darke side, gets darker and nastier, in the same way that the Harry Potter books get darker with each one. These books are long, but really are quite quick to read. I know you are probably gulping like I did at the length at the book, but the pages are actually quite small in length. The book has the most beautiful illustrations in it, just like the last. Unfortunately I forgot to take pictures of some of them before I took it back to the library, so if you happen to see a copy in a bookstore, do have a look at the pictures. They are truly awesome. I would definitely recommend this series of books. As I mentioned in my previous post, if you love Harry Potter, then I feel you would definitely enjoy these. See, look, nice short post. That was a short review ;) But it still told me all I needed to know. Another for the list. Even though these are geared to a younger audience than I'm used to I have enjoyed this series too. I haven't read the latest one yet. I am glad you enjoyed it, Vivienne! I'm glad you're enjoying the series, Vivienne! I definitely want to read it sometime. I love this series - I really want to read the latest in the series soon. I've never read any of these but they have the coolest covers. These looks like books my husband and son would like. Thanks, Viv! I am going to look for these asap. Wow! What a chunkster read, huh? LOL. I've read the first two in this series aloud to my kids - and we all enjoyed them very much. Great review! I plan on reading the first one eventually. I've heard nothing but good things about this series. My son has this series. He keeps suggesting (telling me) I should read them! wow 521 pages! And what a great cover, this sounds like a fun series. the illustrations sound good too. This is a gorgeous looking book and I am off to read the review of the first one. I think this is the first time I have come to your blog and I love the look of it. I am back and wanted to let you know that I talked about your blog and this book on my morning meanderings. Thank you for a wonderful review. I encourage you to stop by today and see the post - it links to your blog and your review.